Manchester University is offering an opportunity for 10- to 14-year-olds to become chefs this summer. 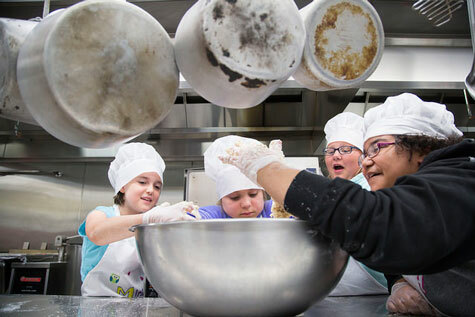 From June 29 to July 1, the North Manchester campus will host Culinary 101, a day camp in which students will learn all about navigating a kitchen. Manchester’s award-winning chef Chris Fogerty – named Chartwells 2014 National Chef of the Year – will lead the camp and teach students basic principles that they can take with into the future. Whether they have culinary experience or not, they are welcome to participate. They will learn about each step in making healthy and delicious recipes, from careful planning and sanitary precautions to the technicalities of cooking. We eat with our eyes first, and Chef Chris will teach them how to make meals look as mouth-watering as they taste. In addition, students learn cooking skills such as sautéing, grilling and flavor pairing. Effective menu planning, setup, preparation and safety precautions will all be a piece of cake by the end of this three-day camp. Grab your chef’s hat and apron, and register now to become kitchen-savvy this summer. The cost is $135 per camper. Lunch is included in the price. It is 10 a.m. to 5 p.m. in Haist Commons at the Jo Young Switzer Center. Prepared by Emily Barrand, media relations student intern.